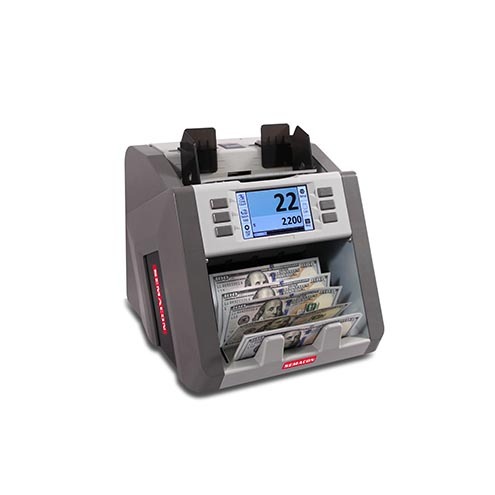 The Semacon S-2200 Bank Grade Single Pocket Currency Discriminator is designed with Semacon's SmartFeed™ technology for maximum accuracy in high volume applications and is used by banks, credit unions, casinos, large retailers and other industries. It features heavy duty construction, operational flexibility and ease of use. This discriminator was developed specifically for banks and other businesses with high cash volumes and is capable of continuous operation in the harshest environments. It features a color graphic touchscreen display and control panel and is one of the most compact single pocket discriminators available.